SRSP with the support of European Union is installing 165 community managed micro-hydro projects (MHPs) with an installed capacity of 21 MW. In terms of progress, the programme has successfully completed all 165 MHPs in six districts of Malakand Division and are producing 21.32 megawatt electricity, benefiting over 82,000 households (over 600,000 population). 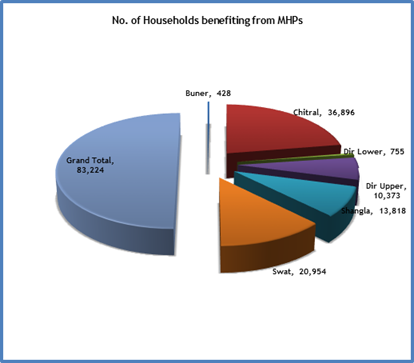 Comparing the figures with baseline, it is evident that SRSP-EU PEACE programme has been able to cover whole of the deprived population through these improved/refined MHP. 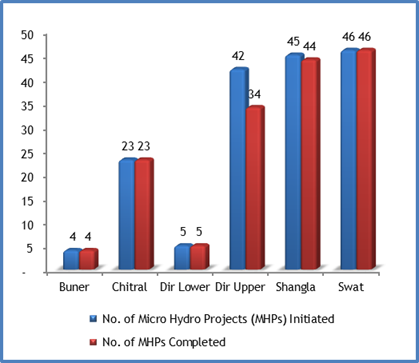 PEACE programme has achieved yet another major milestone and it has enabled SRSP to excel from producing kilo to megawatts through initiation of Golen 2 megawatt and Ashuran 1.2 megawatt electricity projects in district Chitral and Swat respectively. The partnership between EU and SRSP resulted in improving existing technology and bringing in technical and technological improvements to maximize efficiency and effectiveness of respective units have been the key features of the programme. SRSP under EU-PEACE programme, for the first time, successfully implemented power projects of larger capacity production i.e. 1.2 and 2 megawatts in addition to small units. The rich blend of EU funding and technical/technological know-how of SRSP improved the rudimentary systems of 1990s. EU-PEACE micro hydro projects have made a remarkable contribution in providing renewable, clean and sustainable energy to local population, which has reduced usage of fossil fuels, besides reducing pressure on precious forests. The environmental and economic benefits of these micro hydro projects are worth-mentioning. The current portfolio of 165 units producing 21.18 MW has been a major contributor in reduction of CO2 emissions by 66,000 tons/year. Similarly, these 165 units would reduce cost incurred on kerosene oil from 3 million to 0.34 €, which would be a huge economic benefit to local population. Interestingly, productive use of sustainable and renewable energy has gained recognition in areas where micro hydro projects have been established. Women and men businesses have flourished (e.g. dried red persimmon) with useful returns (up to 156% increase in income) to further support their families and improve their livelihoods. These MHPs have also contributed in promoting social cohesion at local level especially in post conflict scenario. Community members (16,000 in nos.) from diverse backgrounds and different economic classes/categories have come together at local level to manage and run these MHPs.